Well, today is Monday. This will be an interesting day. I have a eye appointment at 0800. Out on Rossmoyne, where traffic is hell. I will probably leave about 40 minutes early to hopefully avoid as much traffic as possible. From now on, all appointments will not be schedule for early in the morning. Mid-morning is going to be just fine. And then around 11ish, I'm going to go get my new car. Update and pictures tomorrow. Yesterday was pretty much of a bust. Sleep. That's right, I slept. Oh, yeah, I did do a couple of loads of laundry. And I baked bread. New recipe. I should have paid closer attention. Four star approval ratings mean nothing. Anyone can give out stars. Amazon has been struggling with fake reviews, good and bad, for years. The Google system is 'bohanga hanga.' There is no verification process. Anyone can 'like' you, or your product. Or, they can do just he opposite and burn you badly. While the loaves I baked were not horrid, they had way, way too much flour. This means that I will slice one of them up this afternoon and leave it in a bowl on the counter. Tomorrow, after it has staled a little bit, I'll use it for bread pudding... really chewy bread pudding. I also bought a domain yesterday. You can now find my blog by typing http://www.ridingon.bike/ now ain't that neat. Oh, and of course, as most of you already know, the Idiot Jerk in the White House is trying to permanently set gender at birth. You will eternally labeled either male or female. I wonder just who is behind this foray into stupidity. Evangelicals? Now, I'll be honest, I don't understand the transgender thing, but there are human beings who are born with the wrong equipment. I will also be the first to admit I don't really know anything when comes to hormones and neurotransmitters. That's why we have doctors and psychiatrists who study these things and have documented their findings. Their opinions need to be respected, whether you like them or not. They are far more valid than centuries old religious writings by men who felt that men were far superior than women who were only created to be vessels, preferably to make baby boys. This is something to satiate the hunger of those too desperate to play God. This afternoon, after the paper work is signed and I have a new car sitting in my driveway. I'm going to give the leaves in my backyard a mow. And my lawn, as well. The wind yesterday should have dried things out. 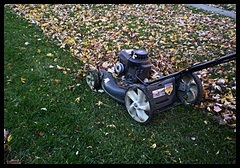 Yep, that's right, I like to mow my leaves rather than rack them to the curb. They are really good fertilizer. Sure, the lawn looks a bit funny, but then I've never been one who needs it to be superficially pristine green. I know one thing. You so don't want to stir up the trans community. And I'll stand right there, too. Plus, our replacement title has already arrived so as soon as our visitors depart, we'll be on the car hunt. When you pick a car, whether new or used, print off the Kelly Blue Book sheet & take it along. wanna see car pix! and my lawn guy mows my leaves too; free mulch! Looking forward to seeing the car pics! Hope everything went well.